The objective in blackjack is to beat the dealer. There are three ways of doing this: get 21 with your first two cards without the dealer also hitting 21, get a hand higher than the dealer without exceeding 21, or let the dealer go over 21, called going ‘bust’. In blackjack, the player is dealt 2 cards and the dealer is dealt 1 card. The player then has to decide whether to take another card (hit) or stick with the existing hand (stand). You can keep taking cards until you choose to stop or go over 21. All cards count as their face value except Jack, Queen and King which all count as 10, and the Ace which counts as 1 or 11. After the player has finished taking cards or has gone bust, the dealer reveals his hand. The dealer has to play by the blackjack rules. This means he to keep taking cards until he either hits 17 or more, or goes bust. After the dealer has finished acting, the hands are compared. If the player hand is higher than the dealer’s hand, the player wins. If the dealer goes bust the player wins. But remember the player always acts first, so if the player busts their own hand first, they lose. Read about different Blackjack versions. There are a couple of other options when playing blackjack. You can ‘double down’ and ‘split’. Doubling down means you double your initial bet and in exchange get one more card. If your first two cards have the same value, you can ‘split’ them into two separate hands. Always remember that a Blackjack after a split is counted as a regular 21, not a blackjack. Another option is the insurance bet. If the dealer’s exposed card is an ace, you can get ‘insurance’ against the dealer getting a blackjack. This is a side bet that pays 2:1 if the dealer gets blackjack. If the dealer doesn’t get blackjack you lose the insurance bet. Now you know how to play blackjack, come and try your luck at the card tables! Blackjack is one of the few casino table games where skill really does count. By playing the game in the ‘correct’ way you can reduce the house edge to as low as 0.1%. The ‘correct’ way to play blackjack is all about playing in accordance with a mathematical strategy which takes in to account the value of your first two cards and the value of the dealer’s up card. It is the combination of these two factors that determines whether you should hit, stand, double or split on every hand. For example, 6 is the worst up card for the dealer because he risks making 16 then going bust. Therefore, if the dealer shows a 6, you should stand on any value of 12 or above, as you do not want to risk busting your own hand when the dealer is likely to bust his. Mathematically, the dealer wins 48% of hands, the player wins 44% of hands 8% of hands are a draw (a ‘push’). As with all casino games there is a house edge built into the game of blackjack. For example, the fact that the player must act first means they can bust their hand before the dealer takes a card. When played perfect strategy, the house edge on blackjack can be reduced significantly to as low as 0.2% or even 0.1%, depending on the house rules. For example, some casinos allow the dealer to hit on soft 17 (a hand value of 17 that includes an Ace), which increases the house edge, but other casinos make the dealer stand. Some casinos allow doubling on any card total, others only on certain totals, while some the surrender rule and others do not. Learn more about blackjack strategy and Blackjack odds. Try out your blackjack strategy and beat the dealer! Playing blackjack online can feel quite different from playing blackjack in a land-based casino. The lack of other players in an online game means there is no pressure to stand or to take a card ‘for the table’. In live blackjack, sometimes pressure can be put on the player sitting on the ‘last box’ (i.e. the last player to act before the dealer finishes his hand) to make a certain decision, regardless of blackjack strategy. Whichever decision they make might prove to be the ‘wrong’ one, depending on what card the dealer gets! There is also no need to worry about finding the right bet for doubling and splitting – everything is automatic at the click of a button. Real casinos can also sometimes be intimidating for new players learning how to play blackjack, so online blackjack is great for getting to grips with the rules of the game and learning your strategy in a relaxed atmosphere. 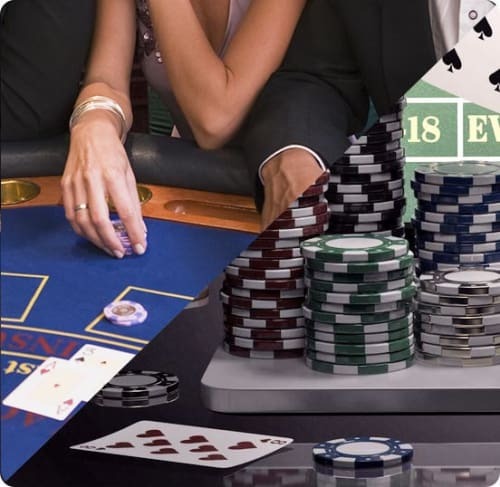 If you enjoy the excitement of playing blackjack in a real casino, take a look at the live blackjack games available via video streaming. These let you play blackjack with real dealers in real time, giving you all the fun of a live casino experience from the comfort of your own home. Play blackjack via live video streaming for an authentic casino experience!